This time tomorrow morning, I will be on my way to sunny Los Angeles for a week of research and interviews for my new book, Hairpins and Dead Ends: The Perilous Journeys of 20 Actresses Through Early Hollywood. 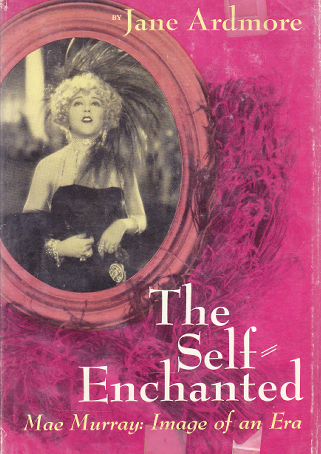 I’ll also be doing a bit of publicity for Mae Murray: The Girl with the Bee-Stung Lips, to be released this fall. As I sit at my desk, I’m dusting off my wings, revving my engines, and cleaning out my suitcases. Not for clothes, you must understand, but for the armload of books I hope to pick up along the way and drag home for bookshelves that are already full to capacity. In this office of mine, there’s hardly room for me, much less another book. A book to me is like a stray cat to my mom: there’s always room for one more. Or, in my case, there HAS to be room for one more suitcase full. A trip to Tinseltown would be rather disappointing if I didn’t hit all the bookshops in town. There are those used bookshops in the Valley–Iliad Books comes to mind. 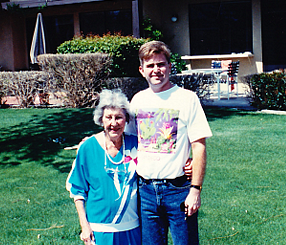 Jim Parish used to take me to out-of-the-way shops in Glendale. Sadly, they closed their doors years ago. There’s also my favorite place to browse, Larry Edmunds, right on Hollywood Boulevard, an institution for lovers of cinema books. Some friends of mine say, “Can’t you just order them from Amazon or other online sites like Alibris Books? Why risk throwing out your back dragging all those books around?” Yes, I could — and I have! When I have an opportunity, however, I like to seek out the dusty bookshops, disappear from the hectic world outside, and take up residence for a couple of hours between the shelves. Like my mom’s love for her cats, I’m always willing to give a cinema biography a new home. There are some real treasures to be found hidden away in old bookshops. Last year, while in Los Angeles, I stumbled upon a book I had wanted for years. 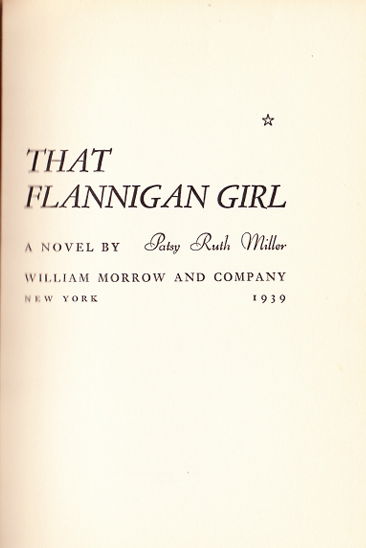 When I least expected it, my fingers brushed across the spine of That Flannigan Girl, the 1939 novel penned by silent film actress Patsy Ruth Miller. 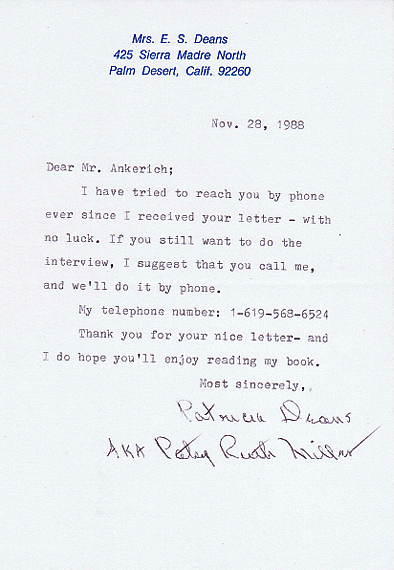 When I interviewed Patsy Ruth in the 1980s, I asked her about the book. She hadn’t thought of her novel in years and doubted I would never find a copy. 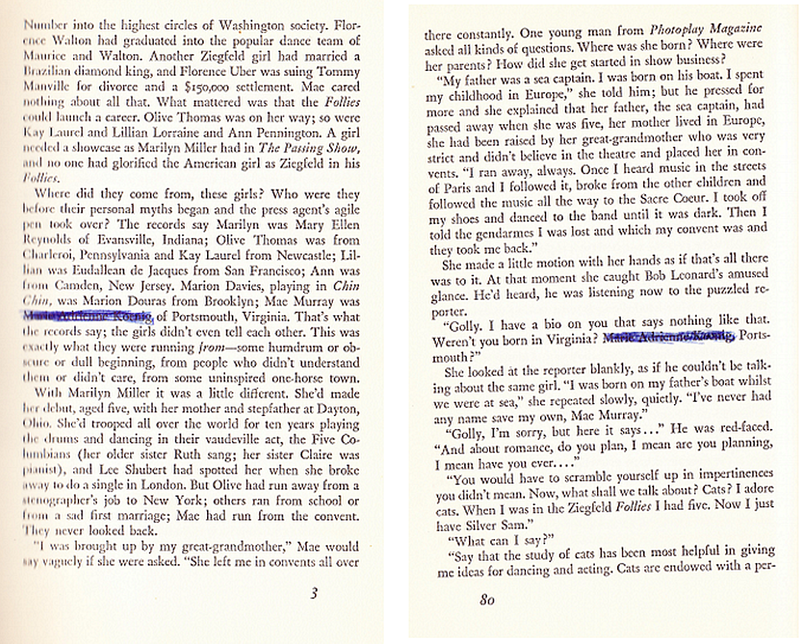 I pulled the book from the shelf and thumbed through its pages to make sure it was not my imagination. When I opened the cover, I was stunned to see it was an autographed copy. 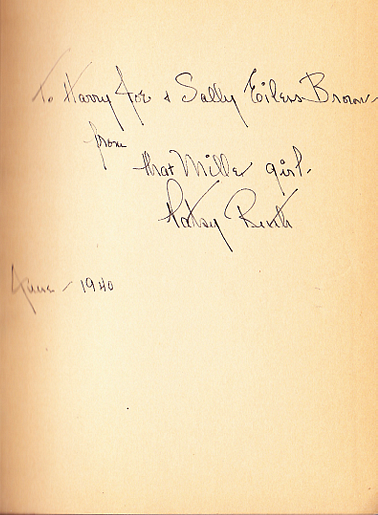 The inscription read, “To Harry Joe & Sally Eilers Brown, from that Miller girl – Patsy Ruth, 1940.” Not only had I stumbled upon Patsy Ruth’s book, but one that she had signed for her friends, producer Harry Joe Brown and actress Sally Eilers. My discovery would not have been nearly as exciting if I had simply “Googled” the title and found the copy on Alibris Books. There’s something about that quest! I’m an autograph collector. I love the art of handwriting and how creative we can be when signing our names. It says a lot about who we are. 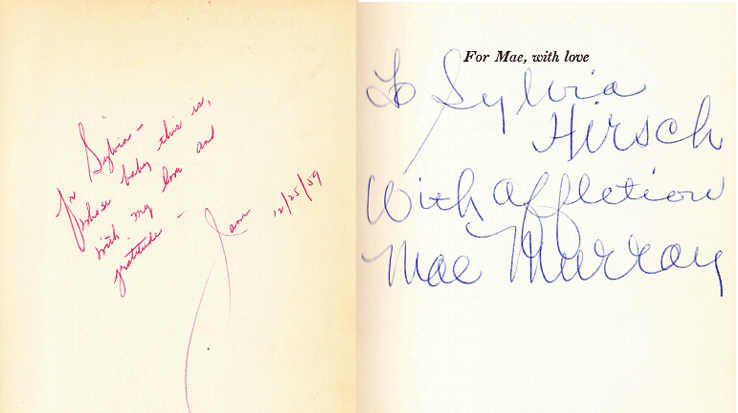 I have my favorite signatures among the silent film set. Theda Bara is one, Corinne Griffith is another. Then, there is Patsy Ruth Miller. I love the backward slant and the way she crosses her “T’s” in the opposite direction. What about the precision in her writing that looks like she used a ruler to keep her handwriting on a straight line? 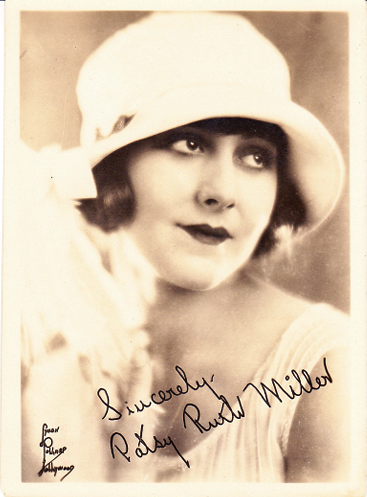 I had trouble getting a real Patsy Ruth Miller autograph when I first wrote to her in the early 1980s. That was before I was seeking out the remaining silent film players and recording their memories. When I wrote to Patsy Ruth, I was told she was difficult in the mail. She didn’t like signing autographs. I found out for myself when I sent her two photographs and asked for her signature. Here is what she sent back. Before I could pull the second photo from the envelope, I knew I’d been duped. Her “signature” was made with the dreaded autograph stamp. Those time savers were used frequently in the silent film days to keep up with fan mail, but 50-plus years after her career had ended? Several years later, I was writing a column for Classic Images magazine. When Patsy Ruth penned her memoirs, My Hollywood: When Both of Us Were Young, in the late 1980s, I asked her for an interview. She responded almost immediately. We had a nice conversation by phone and the article was a success. I devoted a chapter to my interview with Patsy Ruth in my first book, Broken Silence: Conversation with 23 Silent Film Stars. The next year, I think it was, when I was on the West Coast, Patsy Ruth invited me and my traveling companions to Palm Desert for a visit. We each took our books to be autographed. She was completely charming and engaging in conversation. When we asked her to autograph our books, she obliged, but with some hesitation. She flexed her fingers, admitting that handwriting caused pain in her joints. When she sat to inscribe the books, she indeed pulled out a ruler to guide her writing. Turns out, she had always used a ruler when signing her name. 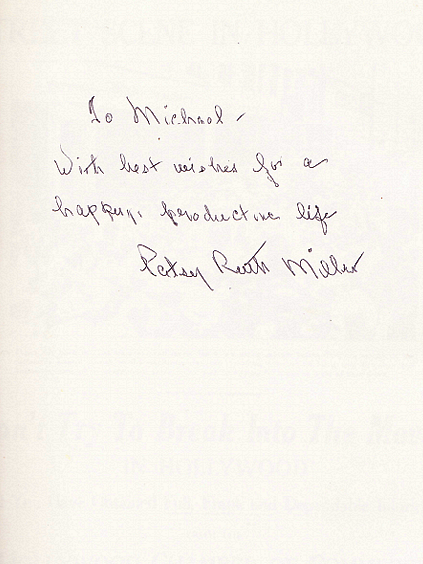 Patsy Ruth Miller's inscription in my copy of My Hollywood. Several years later, when I was traveling through the area, Patsy Ruth asked me to stop by for a visit. On our way to lunch at the clubhouse, she chastised me for the Coca Cola can in the center console. She told of an accident she had been involved in years before when the driver diverted his attention to take a swig of a drink. (I venture to guess she wouldn’t be a fan of texting while driving). At lunch, Patsy Ruth took out a cigarette and waited for me to light her up. I asked her about fan mail and why she rarely answered requests for autographs in the mail. She confessed to being annoyed when “fans” wrote saying she was their favorite star of all time, when she hadn’t made a film in years. She doubted most had ever seen her in a silent film. Patsy Ruth nabbed a golfer to snap our photo in front of her condo. If you ever see My Hollywood: When Both of Us Were Young among the shelves of a used bookshop, grab it up. It’s one of my favorite Hollywood memoirs. It reads like you’re sitting with the author as she recalls her journey through Hollywood. It’s conversational in tone and she’s a great name dropper. The photos alone, most from her collection, are worth the price you’ll pay. A few days from now, I’ll be in Los Angeles on a quest for books I somehow missed over the years. If you see a guy sitting on the floor in the cinema section of the bookstore, it’ll be me. I’ll be looking for a new biography to fill my suitcase. Come up and say hello! 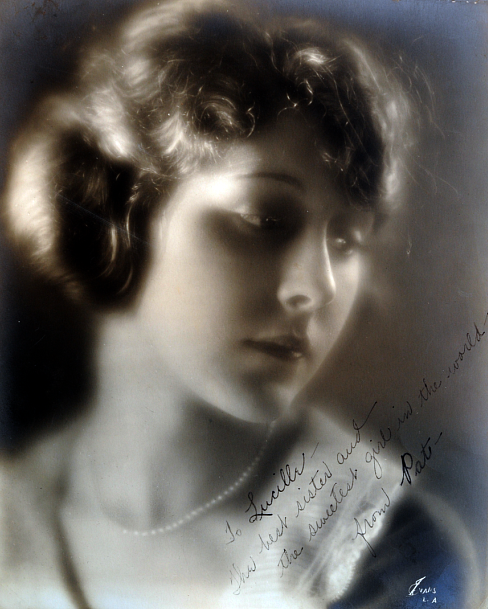 Patsy Ruth Miller signed this portrait to actress Lucille Ricksen when she played her sister in Remembrance (1922).